It’s finally June and we’re starting to see some lovely summertime sun! People are definitely getting cheerier this time of year with the summer weddings kicking off and countdowns to holidays nearing an end. This month’s birthstone is a beautiful pearl. Natural pearl are formed inside oysters to protect them from harm. 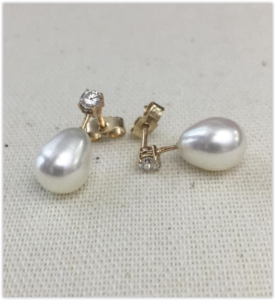 The process of creating a pearl takes at least 3 years sometimes even 8 until the pearl is fully formed. As well as being the perfect gift for the June babies in your life Pearls are also commonly given on the 3rd and 30th wedding anniversary. Pearls are a timeless piece that works so well no matter what you’re wearing and should be in every girl’s jewellery box. You can find more of our lovely designs over on our Instagram, click here if you would like to follow us.